that the simple act of monitoring your mind & body can have a profound effect on your overall well-being; making you less susceptible to stress, fatigue and illness. Plug your iom biofeedback hardware into your computer. Follow the instructions on the disk jacket to install disk contents. Follow the 15-Step Training Program and enjoy! Practice these mind-body techniques along with your mentors as you listen to transformative music and watch soothing visuals rippling by on your screen. Or switch to the Grapher Mode and track your body’s signals as they rise and fall in synch with your state of mind. Finally, you'll complete each step by practicing your new skills during the interactive biofeedback events. Watch your mind and body at play in beautiful on-screen surroundings as you learn to juggle balls with your laughter, build a stairway with your breath, and meditate to open doors! As you begin to master your new skills, you can increase the difficulty level of each challenge for hours and hours of deep contemplative practice. Introducing our newest and most complete whole-body wellness training program, Healing Rhythms. 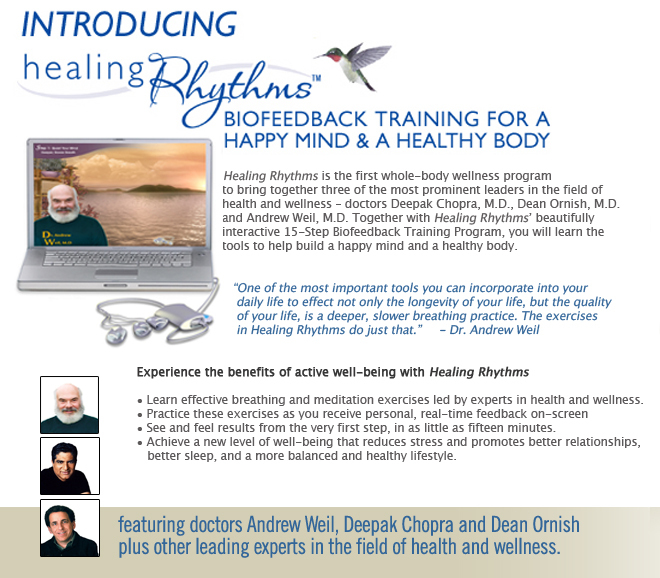 The first biofeedback program to bring together the leaders in the field of health and wellness – doctors Deepak Chopra, Dean Ornish, and Andrew Weil. Together with Healing Rhythms' beautifully interactive 15-Step Biofeedback Training Program, you will learn the tools to help build a happy mind and a healthy body. • Grapher Mode where you can monitor your body's physical and emotional response in real-time, helping you to change and improve your reactions to stress. Explore Healing Rhythms new 15-Step Training Program and learn to reduce stress as you create a happy mind and healthy body. How can biofeedback help me achieve a longer, healthier, happier life? Stress is medically proven to have negative effects on the body and takes its toll on our physical and mental well-being on a cellular level. According to the Centers for Disease Control and Prevention, up to 80 percent of the doctor visits in the USA are triggered by a stress-related illness. Healing Rhythms unique biofeedback program is designed to help you uncover your body’s own natural ability to counter the wear and tear that everyday stress has on your health. "Healing Rhythms uses biofeedback to access your innate healing abilities to restore your physical, mental and spiritual health." With just a few minutes of practice each day, you’ll improve your energy level and your ability to connect with the world around you. In short, you’ll begin to wake up to your life in new and profound ways. 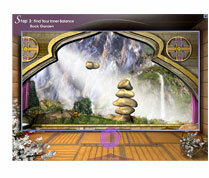 Healing Rhythms lets you practice your new skills in unique and challenging biofeedback events like this one, where you learn to build a zen rock garden through steady and balanced thought. Then, switch to Grapher Mode and track your body’s signals as they rise and fall in synch with your state of mind. Biofeedback monitors your physical and emotional responses to stress and provides feedback that helps you learn how to activate, balance, release and recover from them for optimal health. The biofeedback unit measures your skin conductance and heart rate variability. This input drives the beautiful biofeedback challenges as you practice the meditation and breathing techniques from the expert guides in each step. The grapher screen, allows you to track your measurements as you transform the rhythms of your mind and body. By following the 15-Step Training Program, you’ll begin to see life-changing results from the very first step. improve your physical and mental well being. At each level, you’ll develop skills that will help you become more present and more mindful, two essential elements to your overall health. Once you’ve mastered an activity you’ll find yourself returning to it again and again, not only to refine your skill, but to experience the pure relaxation and joy it creates. With just a little practice, you'll be able to quickly and easily start integrating these new skills into your daily life for a happy mind and a healthy body. Healing Rhythms - Call 212-222-5665 - Wild Divine Healing Rhythms Biofeedback System Delivers Stress Relief, Meditation, Stress Management & Relaxation. Wild Divine Healing Rhythms Training Program Provides Alternative Healing, Alternative Medicine, Wellness Tools & Self Improvment.